On 22-23 March 2018, the three Nordic Centres of Excellence CLINF, ReiGN and REXSAC organized a workshop on the ‘challenges and opportunities of supplementary feeding in reindeer husbandry’ in Kiruna, Sweden. A brief summary of the workshop follows below. The organizers are now preparing a more comprehensive report in collaboration with the attending reindeer herders. 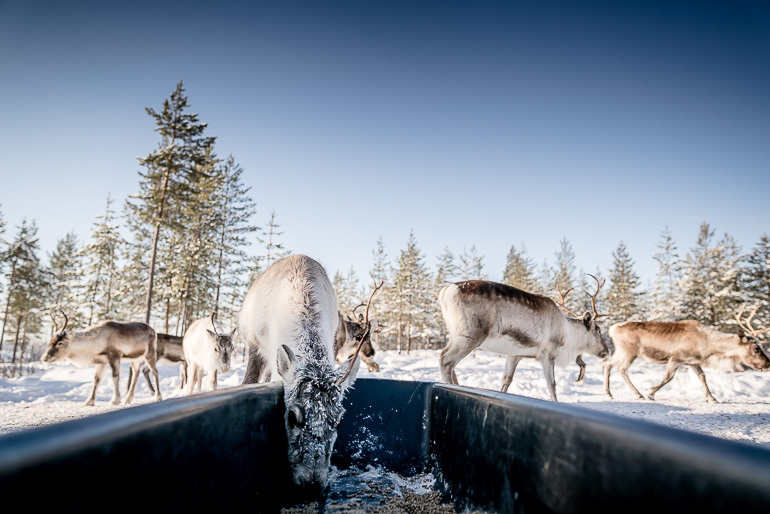 In reindeer husbandry, supplementary feeding has become an increased necessity to cope with difficult grazing conditions, declining availability of natural grazing resources or increasing fragmentation of grazing grounds. However, supplementary feeding involves difficult choices for reindeer herders to maintain their traditional herding practices. The application of and experience with supplementary feeding varies considerably in the Fennoscandian reindeer husbandry area: while already practiced for several decades in southern reindeer areas of Finland, supplementary feeding is not yet as common in Sweden, Norway and northern Finland. 24 reindeer herders from Finland, Norway and Sweden participated to the workshop and shared their experiences about the economic, cultural, institutional, environmental, and health-related concerns involved in supplementary feeding with each other, as well as with 20 researchers (e.g. anthropologists, geographers, ecologists, sociologists, veterinarians, etc.) from the three different NCoEs. The workshop was a first important step to create a basis for sharing experiences and to gain further insight into barriers and opportunities linked to supplementary feeding. However, more interaction between countries will be necessary in the future to enable the exchange of detailed knowledge of the complexities and challenges related to supplementary feeding. Given the very difficult grazing conditions in the winter 2017/2018, the workshop can be considered a timely and necessary addition to the existing work in the NCoEs.